Britain was in the grip of a major UFO alert throughout the early months of 1909. Suddenly ordinary people from all over the country started seeing extraordinary airship-type objects in the skies. The reports of strange craft that "whizzed" or "whirred" their way through the heavens flooded in from places as far apart as Belfast, Ireland, and Ipswich towards the east coast of England. To augment the mystery even further, reports of strange craft were even sometimes made from two far apart places on exactly the same night and at around the same time, presumably meaning that at least two unidentified craft were abroad concurrently. Obviously, something tangible was out there - but what exactly? Could it really be possible that people were seeing some type of forerunner of the modern UFO? Or is there, after all, a more down-to-earth, albeit just as fascinating, answer to the very bizarre affair? One of the very first reports of a Scareship, which is how the mysterious aerial craft later became known, came from Peterborough, Cambridgeshire. Here, on the 23 March, two police officers out and about in the early hours of the morning - and interestingly enough in two different locales - witnessed a long oblong shaped object with a powerful light attached passing overhead at some considerable speed. Both witnesses stated that the mystery craft made "the steady buzz of a high power engine" as it ''sailed'' noisily by. Efforts to explain this early sighting of a Scareship were later made, and these included the rather lame and unconvincing official statement that the witnesses had seen nothing more exotic than a kite. Unbelievably, too, a Chinese lantern fixed to the kite was cited as a plausible explanation for the powerful light seen by the two policemen. The engine sounds heard by the two constables been dismissed as nothing more than the whine of a motor kept running throughout the night at a local cooperative bakery. (Sound familiar In the light of equally ridiculous official explanations for some modern day UFO sightings?). From the eastern counties, too, came reports of something peculiar haunting Britain's skies. In particular a Captain G.A.F. Horvey, Sturton, reported to be a Local Government Board Inspector for the Eastern District, said that whilst walking towards Broome, Near Eye, on Sunday 16, May, he observed a cigar-shaped craft heading in the direction of Lowestoft. The particular object traveled against the blustery northeast wind in an easterly direction. Perhaps because of his social standing, Captain Horvey's Scareship encounter was treated by the press as very real. Coincidentally it was also seemingly well verified by other independent and 'acceptable' witnesses. For example, a Mr Edwards, chief clerk to an established Lowestoft firm of Solicitors, stated that whilst ambling towards Lowestoft at around midnight on Saturday 15, May, he had the following odd encounter: "When looking around, and lifting my eyes, I saw two or three lights, and they appeared to be a short distance from the ground. I paid very little heed to them, and walked on. "I heard a peculiar noise, and this time, upon looking round, I noticed a glaring light, which seemed to be coming towards me. "To make certain there was something moving, I got behind a large tree, and then I observed a dark object ascending. It passed over my head and proceeded in the direction of Lowestoft." The skipper of a Lowestoft fishing boat saw the strange object, too. He reported that he and his crew heard a commotion overboard and gazing above witnessed a dark craft of huge dimensions. The skipper even claimed to have lit a flare and seen the occupants of the extraordinary aerial craft above ignite another flare in return. Oddly reminiscent, I feel, of the well-known Papua, New Guinea, UFO case (See endnote no. 1 ). Reports of the mystery aerial objects were made from Hull in the north east of Britain, too. A Mr A Walker from the Coltman Street, Hessle Road, area of the city reported seeing a "patch of light" at around 11 p.m. on Thursday 13 May. Mr Walker said that the object he encountered appeared to be "tacking a little as if It was going against the wind which was forcing it back". To reinforce his sighting Mr Walker called to his parents who witnessed the flying apparition, too. The Scareship was like a "light suspended in the air," the Senior Mr Walker later told interested reporters. A resident from the Regent Street area of Hull later contacted the local newspaper to report that he, too, had seen the strange "patch of light". This particular witness reckoned that the position of the "light" was such that "It would be impossible to be regulated from any airship." He added, however, that it "may have been from a landing apparatus. 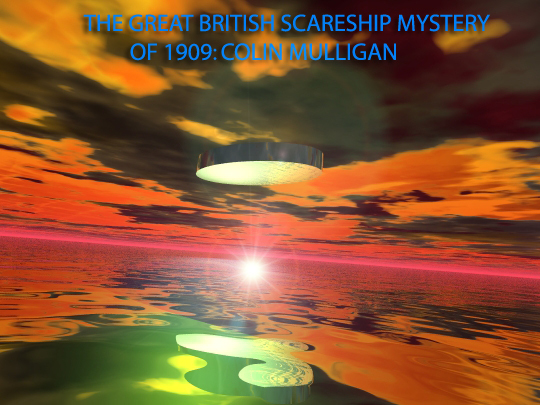 "Despite the outright strangeness of some sightings, many people still postulate that the 1909 Scareships were terrestrial in origin. Could the mystery aerial craft possibly have been prototype airships been surreptitiously tested by enterprising individuals or companies? Could this perhaps explain the claim made by two friends, a Mr Grahame and a Mr Bond, that on the 13 May they happened upon a pipe smoking German and a "clean-shaven" American at the beer-pump-like controls of a massive airship resting on Ham Common, London. Although mysterious the two aeronauts were apparently friendly enough, the German even asking the two friends if he could borrow some tobacco for his pipe. Or is it more credible - remembering, of course, that Europe was, at this time, steadily gaining momentum for the outbreak of the Great War - that the Scareships were actually German Zeppelins been secretly flown across the North Sea on reconnaissance missions? Serious concern concerning the rapid development of Zeppelins had certainly been vocalized by members of The Committee of Imperial Defence, whilst as early as July 1908 the British Admiralty acknowledged that they, too, had been following the rise of German airship technology very closely (see endnote 2) . Obviously the Zeppelin threat was real. Without a doubt it would make sound military sense for the Germans to maneuver their airships across the North Sea, using them to gain a detailed knowledge of Britain's topography (see endnote 3). But is it really possible that the Scareships and Zeppelins were actually one and the same? One main objection to the Zeppelin theory is that airship technology, German or otherwise, was just not advanced enough for such lengthy and dangerous tours of duty. But in answer to this objection, several instances of successes in sustained airship flight before and contemporary with the May 1909 Scareship sightings could well be cited. Firstly, the Zeppelin LZ 4 had already made a flight of 21 hours and of a distance of 370 miles. Also Zeppelin LZ 5 had successfully covered a distance of 603 miles on a flight lasting around 37 hours 40 minutes (See endnote 4) . Undoubtedly, airship technology had come a long way since the first truly dirigible flight of Charles Renard and Arthur Krebs (See endnote 5). The capabilities of airship flight, although admittedly fatally unstable at times, were to all appearances still expanding rapidly. Further credence to the Zeppelin theory was perhaps given by what surely turned out to be the most bizarre Scareship sighting of all. On the night of 18 May a traveling Punch and Judy showman called C Lethbridge, whose address was given as Roland Street, Cardiff, was crossing Caerphilly Mountain when he happened upon the following strange scene: "When I turned the bend at the summit I was surprised to see a long tube-shaped affair on the grass on the roadside, with two men busily engaged with something near by. · A quantity of pulpy paper, perhaps of the kind used in packaging. · The lid off a tin box of metal polishing paste. · Some sheets of well made writing paper with illegible figures written upon them. · A small plug on a chain with a red label attached. (See endnote 6). · And perhaps most consequential of all, various newspaper clippings, mostly referring to airships or the German military. Soon after the Welsh encounter and subsequent bizarre "finds" on Caerphilly Mountain, the British Scareship sightings of 1909 seemed to have debated. Exactly what they were will, it seems, linger on a true and profound mystery. 1. On 27 June, 1959, a certain Father Gill and several other witnesses encountered a large UFO with four humanoid figures on board. According to Father Gill when he stretched his arm above his head and waved, "To our surprise (one of the figures) did the same." For a more detailed account of the "Boianai Mission Encounter" see UFO Magazine May/June 1999 issue. Page no. 24. 2. It was precisely because of these fears concerning the rapid growth in Zeppelin development that in July, 1908, the Director of Naval Ordnance Captain R.H.S. Bacon, DSO, proposed Vickers Sons & Maxim submit an airship design for use by the RN. Work on the Mayfly was started nearly straight away at a special floating-shed at Barrow-in-Furness. Unluckily, however, the Mayfly later crashed on her maiden flight on 24 September, 1911. 3. Interestingly enough, it's now well known that only a short time later on 19 October, 1914, Zeppelin L.5 made a successful reconnaissance flight over the North Sea as a preliminary to a later raid in which bombs were dropped on Great Yarmouth and King's Lynn. On 9-10 August, 1915, raids by Zeppelins were also carried out on Goole and Dover. The bombing of Goole actually claimed the lives of 16 people. 4. The LZ 5 made its historic flight of 603 miles on a flight lasting 37 hours 40 minutes on 30 May. Although, severely crippled en-route it did, however, manage to limp back to base. 5.The electric airship 'La France' took off from Chalais Meudon and returned after a 23 minute flight on 9 August 1884. 6. After an official inquiry, this little object turned out to be a valve cap affixed to a particular type of Michelin Tyre Company tyre inflator. The valve cap was apparently used to depress a little plunger in the valve, allowing air to be pumped into the tyre. Such ingenious devices were sent out with a small chain and red label attached with guidance notes for usage. To add further intrigue, it was found out that this particular type of valve cap was only available in France. Consequently it was presumed that the Caerphilly valve cap must have arrived there from on the continent somehow. Brookesmith, Peter. UFO - The Complete Sightings Catalogue ( Blandford 1995). Chamberlain, Geoffrey. Airships - Cardington (Terence Dalton Limited. 1984). Jackson, Robert. Airships. (Cassell & Company Ltd. 1971). Watson, Nigel. British Scareships (Orbis partwork 1984).